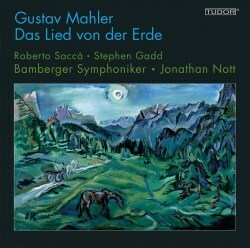 I haven’t heard all of Jonathan Nott’s Bamberg Mahler cycle, but I’ve really enjoyed the ones I have. With one serious exception, this Lied is very good and it’s worthy of standing alongside his take on the symphonies. The best thing about is the playing of the Bamberg Orchestra, who come to Mahler’s final song cycle with all the experience and insight already generated by playing all the symphonies. The kaleidoscopic variety of their playing is a constant delight. The horns at the opening are clear as a bell, and the big tutti that follows is clean and transparent, never foggy. The winds are particularly fine throughout, especially in the even-numbered songs. The long, flowing oboe cantilena at the opening of Der Einsame in Herbst is entrancing and casts a pale light over the whole of the rest of that movement. Its keening sense of loneliness at the outset of Der Abschied has a similar effect, but it can also sound blithely humorous, as it does at the opening of Von der Jugend. There is a shimmering, translucent effect of the string playing in Der Einsame in Herbst, too, that seems to drop a pall of isolation over the music, and the rich, flowing drama of Der Abschied is also marvellous. Linked with this, Nott himself has a whole canon’s worth of experience behind him now, and that comes through in his shaping of Mahler’s great paragraphs. That is heard nowhere finer than in Der Abschied, where Nott keeps things flowing while never sounding hurried. Instead, the whole canvas seems to unfold at just the right pace, climaxing in a radiant account of the final words, written by the composer himself, and a shimmering, ethereal evocation of the final Ewigs. The tenor, Roberto Saccà, sounds excellent. His heldentenor experience comes into its own here, ringing with great strength through the perils of the first song, even at the hell-for-leather climax of the ape howling amongst the tombstones. He then lightens the voice beautifully, with only a tiny shade of pushing, in the narrative of Von der Jugend, and he even manages some humour in Der Trunkene im Frühling. But that brings me to my major reservation, and that’s the baritone of Stephen Gadd. He matches neither his singing partner nor the orchestra in his beauty and depth of expression, and too often his singing sounds pale and anodyne. He never makes a sound that is unattractive, but simply singing the notes isn’t good enough in this work, especially when you have such marvellous partners alongside you. The narrative of Der Einsame in Herbst comes across perfectly well, but the emotional depth does not, and the same is true, more damagingly, of Der Abschied. At the moment where the moon first appears, for example, there is no quickening of the pulse or deepening of the intensity. We get a tour of nature rather than an insight into the soul, and it doesn’t help that he tends to sing at mezzopiano for almost the whole song, until he gets to the direct speech sections at the end. That shouldn’t torpedo the choice for someone who is committed to Nott’s Mahler cycle and, as I mentioned above, this is in many places a very strong recording that should stand alongside the symphonies. It can’t be anything more than an also-ran in the overall panoply of recording of Das Lied, however. Even though Mahler didn’t expressly ban it, I think you need a really good reason not to use a mezzosoprano for this work. Fischer-Dieskau showed how it could work, as, to a lesser extent, did Thomas Hampson. However, they can’t stand up against the insights brought by the greatest ladies. Step forward Brigitte Fassbaender if you really want to hear how it’s done, or, better still, Christa Ludwig for both Karajan and Klemperer. The infinite depths of Kathleen Ferrier scarcely need mentioning.